This private Tuscany tours is a treat! 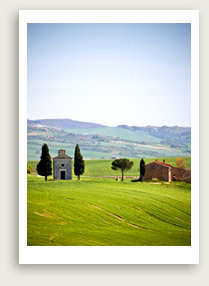 Get off the tourist path with this scenic tour of the countryside of Tuscany. 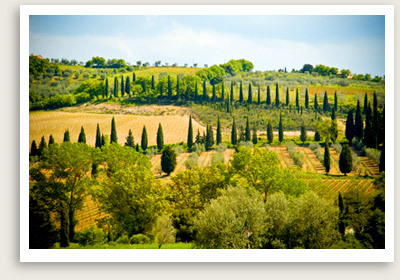 Optional: Farm visit and “farm feast” with wine sampling in San Gimignano. Tuscany Tour Includes: Our private tours (day trips) of San Gimignano and Volterra includes private “driving guide,” private transportation to and from your hotel or apartment, taxes, tolls and parking. Note: Lunch reservations necessary for farm visit. Please read on. Enjoy a scenic ride through the Tuscan countryside and have a private tour of two of the jewels of Tuscany: San Gimignano and Volterra. 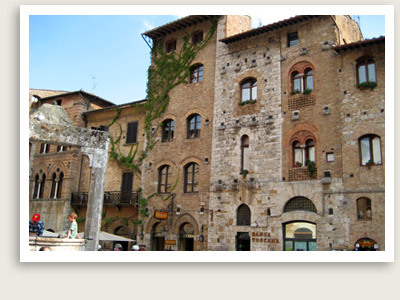 Your excellent private tour guide will take you to the medieval walled city of San Gimignano, your first stop. You’ll glimpse the famous towers of San Gimignano from a distance. (The town originally had 72 towers; only 15 are left today.) We’ll stroll the city and stop in the main squares, Piazza della Cisterna and Piazza del Duomo. You’ll have free time to visit the church called La Collegiata, as well as the civic museum. You may also climb the big tower, see the fortress and the unusual torture museum, or enjoy the great shopping on the San Giovanni and San Matteo streets. We suggest a stop at a family-owned farm where they raise cattle and grow everything from saffron to olives and grapes. Wonderful wine, olive oils, cured meats and honey are produced on the farm, and you can have lunch on their terrace, accompanied by San Gimignano’s great white wine called Vernaccia. The view here is incredible, as you can see the hill-top town of San Gimignano past the valley and beyond. A lunch here is just perfect, an experience not to be missed. Later, your tour guide in Tuscany will also take you to the charming walled city of Volterra, a delightful Etruscan town enclosed by intact 12th-century walls, with remnants of its defensive walls and Porta All’Arco gate dating back to 7th century BC. The guided tour will cover Volterra’s major sites, including a first century BC Roman theater. You will have time to explore Volterra’s narrow cobbled streets, visit an alabaster museum and drop in an alabaster shop to see an artisan at work.